DOGE coin is on the rise again, after being one of the best alternative scrypt-based crypto currencies to mine instead of LTC a few weeks ago. If you are currently mining LTC directly, then you should reconsider and start mining DOGE coin and after that selling the DOGE for LTC. This way you will make much better profit than directly mining for LTC coins, at the moment directly mining DOGE coins and selling for LTC you can double your profit. Simply said by mining DOGE coins you can end up with twice the profit than directly mining LTC coins at this moment and the profitability may go even higher than that. 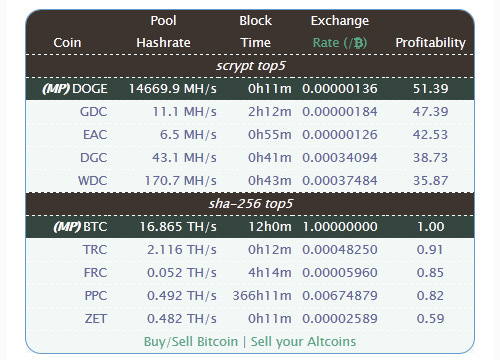 So if you have GPUs mining for LTC switch them to mine DOGE for now. The other good thing about mining DOGE coins and trading them for LTC is that the LTC difficulty will not rise as much and in fact may even drop a bit, so it will be easier to mine Litecoins if and when DOGE is not that profitable anymore to mine. So definitely a win-win situation – you get about double profit and will make LTC easier to mine in the feature. Where to mine DOGE coins? Where to sell DOGE coins?